Unexpected Homeschool: October is Dysautonomia Awareness Month. Although recently I've been talking more about Amber's Ehlers Danlos, we've known about her dysautonomia for longer. The two conditions are quite often seen together. 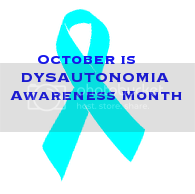 "Dysautonomia means dysfunction of the autonomic nervous system. The autonomic nervous system is the master regulator of all unconscious organ function throughout the body. It is involved in the control of heart rate, blood pressure, temperature, respiration, digestion and other vital functions. Dysfunction of the autonomic nervous system can produce the apparent malfunction of the organs it regulates. For this reason, dysautonomia patients often exhibit numerous, seemingly unrelated maladies." "Orthostatic intolerance is present when patients experience symptoms such as lightheadedness, palpitations and tremulousness during standing. Many patients also note other symptoms with upright posture: visual changes, discomfort in the head or neck, throbbing of the head, poor concentration, tiredness, weakness and occasionally fainting. Patients can be severely impaired by these symptoms and signs, such as a bluish-red suffusion of skin in the lower extremities on standing, which are relieved by lying down." 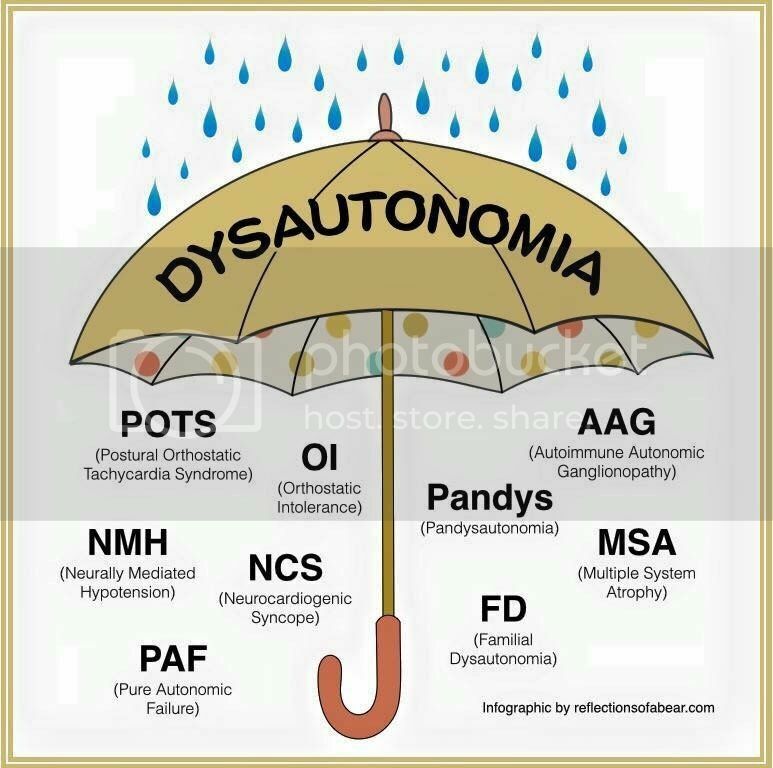 The above graphic does not include every possible sub-type of dysautonomia, and some people do not have one specific sub-type. Amber has what is considered a hybrid version of Postural Orthostatic Tachycardia (POTS), along with OI (orthostatic intolerance), Neurogenic Orthostatic Hypotension (nOH), and the neurologist is still looking at clinically diagnosing AAG. Dysautonomia in it's various forms are actually more common than you might imagine, however due to the numerous body systems that can be involved it is often hard to diagnose and sometimes even harder to pinpoint the underlying cause. There are treatment options to alleviate some of the symptoms of dysautonomia, but it takes a knowledgeable physician who is willing to listen carefully to the patient. We are so grateful to have many kind, informed and open-minded doctors treating Amber. I'm sorry to hear that Amber suffers from the Dys + EDS combo too - it's not fun! Did you know I also have an easy-to-understand explanation of Dysautonomia on my blog? I wrote it to help friends understand what it was, and how it impacted my life.